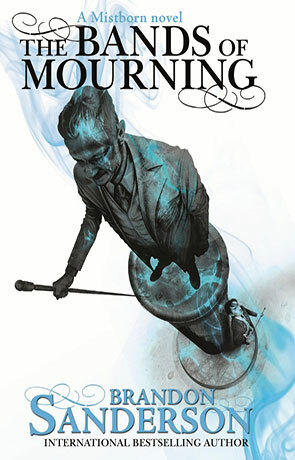 The Bands of Mourning, part of the second series of Mistborn books, taking place hundreds of years after the original Mistborn trilogy, follows the adventures of Wax, Wayne, Marasi, and Steris once more. The Bands of Mourning are the mythical metalminds owned by the Lord Ruler, said to grant anyone who wears them the powers that the Lord Ruler had at his command. Hardly anyone thinks they really exist, but now there’s proof that they might, and Wax, Wayne, and Marasi are recruited to investigate. Along the way, Wax discovers hints that point to the true goals of his uncle Edwarn and the shadowy organization known as The Set. When I first started the second Mistborn series (which begins with Alloy of Law and continues with Shadows of Self), I thought it was a nice, fun, action-packed novel. I did not expect what was to follow—twist after twist, building on the first Mistborn series, philosophical insights without any preachiness, and a series that runs just as deep as its predecessor (something I honestly hadn’t expected). Sanderson is an expert worldbuilder. Let me give credit to that above all else. He has created something so fantastic that I have had a really hard time finding any fault in it, or any holes in his logic. Everything he writes just adds to the world he’s created, and I find myself desperate to soak up every extra detail we get, down to the Survivorist and Pathian religions, and the way that the Survivorist priests wear their robes. It all feels wonderfully, perfectly natural. I am also thoroughly in love with the characters. Wax is fantastic as the main character, but it’s the supporting characters who really make the series for me. Wayne, with his fear of guns and fascination with accents, is my absolute favorite. He has made me laugh, consistently, through all three books. He is the perfect compliment to Wax, and the two of them together never fails me. And then there is Steris, Wax’s betrothed. I didn’t initially like her and have grown to love her. The romance in this series is impressive. It doesn’t diminish the previous relationship that Wax had, but rather acknowledges it and the impression it has made on Wax, and then looks at Steris as something entirely new and different (and gives him time to grow fond of her, to learn more about her, just as the readers do). It’s beautifully done. The way that Sanderson gives us glimpses of Steris, bits and pieces in Alloy of Law and a bit more in Shadows of Self still left me unprepared for the way my love for her would grow in The Bands of Mourning. Steris likes lists and preparing; I appreciate all of her, but especially her (sometimes difficult to hear) honesty. I could talk about all of the characters in this series endlessly. MeLaan, the kandra, is my favorite immortal being and I love the humanity she has. Marasi is a fantastic, strong female character, and I’ve loved her from the start. All of the characters are flawed and multi-faceted, and they all hold a special little piece of my heart (even the villains are interesting—I’m looking at you, Suit). In Shadows of Self, I found myself tiring of the overarching theme of faith (and how faith is about believing in something when you don't have all the answers). In Shadows of Self, Wax is severely tested, and I appreciated what we got from Harmony (God) about choices and decisions and how making the best choice doesn’t mean it’s a good choice. I could dig into what I didn’t like about the book. If I really, really tried, I could find a few things that annoyed me. But I loved this book, and I don’t feel the need to tear apart the little bits. This is my favorite novel of the second Mistborn series so far, and I am eagerly anticipating the next. In short, if you haven’t read the Mistborn series, read it now. You’ll thank me later (though you may be a touch emotionally scarred—trust me, it’s worth it). Written on 5th February 2016 by Vanessa.